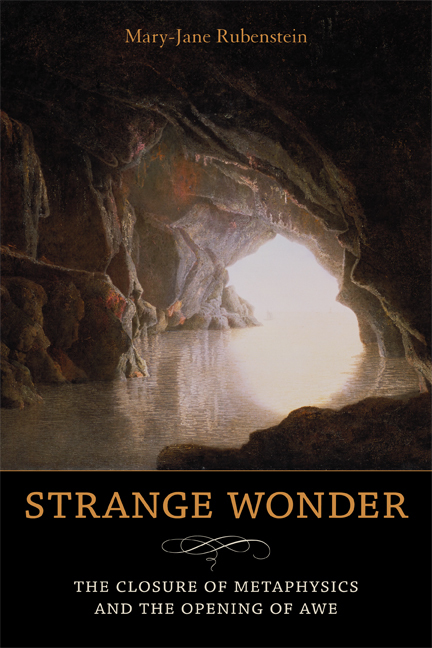 Strange Wonder confronts Western philosophy's ambivalent relationship to the Platonic "wonder" that reveals the strangeness of the everyday. On the one hand, this wonder is said to be the origin of all philosophy. On the other hand, it is associated with a kind of ignorance that ought to be extinguished as swiftly as possible. By endeavoring to resolve wonder's indeterminacy into certainty and calculability, philosophy paradoxically secures itself at the expense of its own condition of possibility. Strange Wonder locates a reopening of wonder's primordial uncertainty in the work of Martin Heidegger, for whom wonder is first experienced as the shock at the groundlessness of things and then as an astonishment that things nevertheless are. Mary-Jane Rubenstein traces this double movement through the thought of Emmanuel Levinas, Jean-Luc Nancy, and Jacques Derrida, ultimately thematizing wonder as the awesome, awful opening that exposes thinking to devastation as well as transformation. Rubenstein's study shows that wonder reveals the extraordinary in and through the ordinary, and is therefore crucial to the task of reimagining political, religious, and ethical terrain. © 2013 - 2019 Mary-Jane Rubenstein. All rights reserved. Contact. Site by boy blue.